I've recently returned from a four-month journey through Western Europe in celebration of my 25th wedding anniversary! What a wealth of visuals Doug and I witnessed in Holland, Belgium, Paris, southern Spain and Portugal. Here are just a few of my photos. You can also visit our travel blog if you are interested at Travellingboomers.blog and check out my Instagram #travellingboomers for more photos! 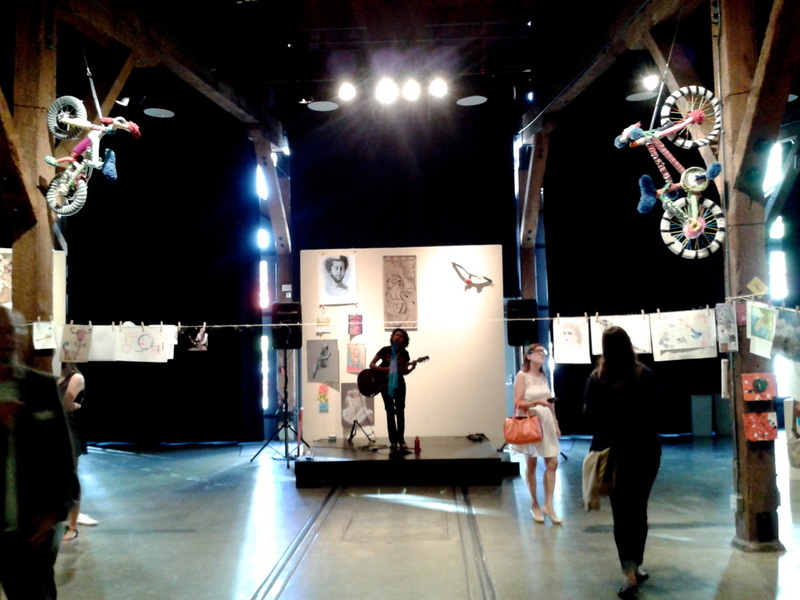 As you can imagine there was plenty to inspire me and it was a chance for a regeneration of my love of art-making. 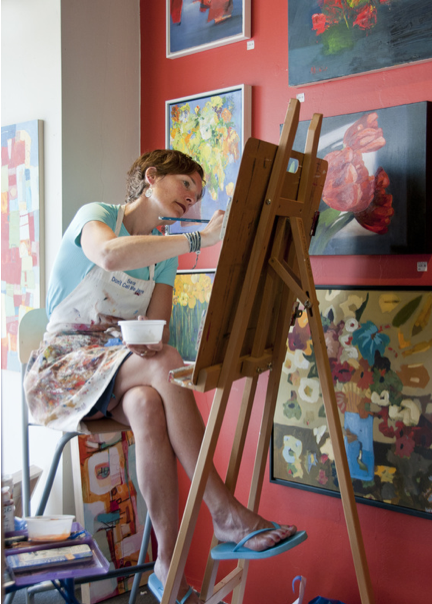 Now I am happily back in my studio with cherished memories, photos to get my creative juices going, and I'm planning a series based on my trip...so stay tuned! It's spring and I am just coming to the end of the 6-month Interaction Design Essentials program I began last fall at Emily Carr University of Art and Design. I have been fortunate enough to attend class in the brand new school building which is a beautiful space for students and faculty alike. The program was very intense and fulfilling and the 13 members of our cohort-11 were a close-knit interesting group of students planning to embark on careers in User Interface, User Experience and Service Design. We completed courses in User-centred design, App Design and Production, Web Development and Mobile-first Development and Interaction Design Studio. Needless to say it was a lot of computer time...so I've been missing my brushes! As part of our program we designed and developed for Wordpress and also created our own portfolio site which I did using Squarespace. My site is 3edesign.ca, where you can see some of the projects I worked on during the program. If you have any questions, are interested in my help for creating a mobile-friendly website for your work or just want to chat about the program, don't hesitate to connect! I am very excited to be shifting gears a bit and going back to school in September. I will be attending Emily Carr University of Art and Design to study Interaction Design, a six-month full-time program, where I will be learning web and application design. 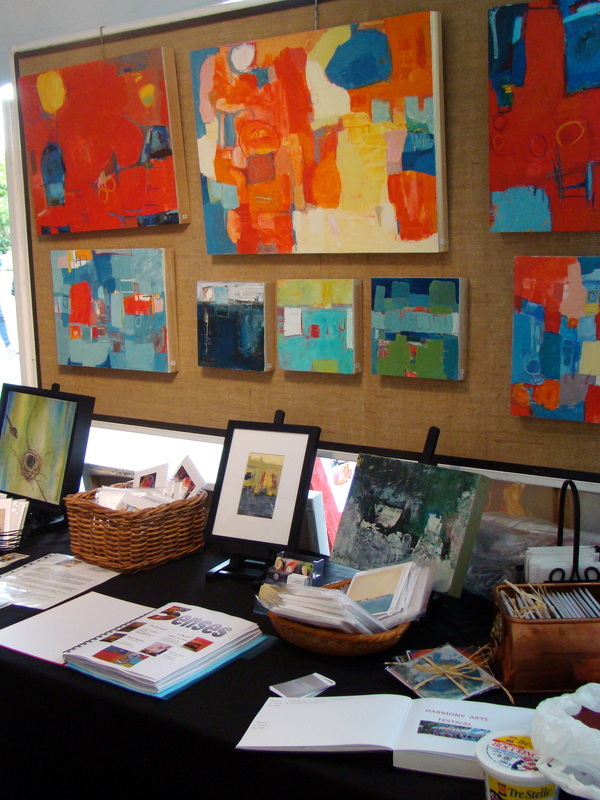 As I have been preparing for this new venture since last summer, you may have noticed I haven't been in my studio or in art shows recently. I have already begun working with some artists and a musical theatre group to build their websites, so the fun has already begun! Stay tuned as I expand my creative life to include design and technological applications of merging my art and psychology backgrounds! Blog post highlighting our show! Mid-July I was asked to open my studio to the Associates of the Vancouver Art Gallery. After an hour-long presentation of my development as an artist and a tour of my studio, we went next door to the District Hall to see some more of my art on the walls. Then we all went to lunch in nearby Edgemont village. 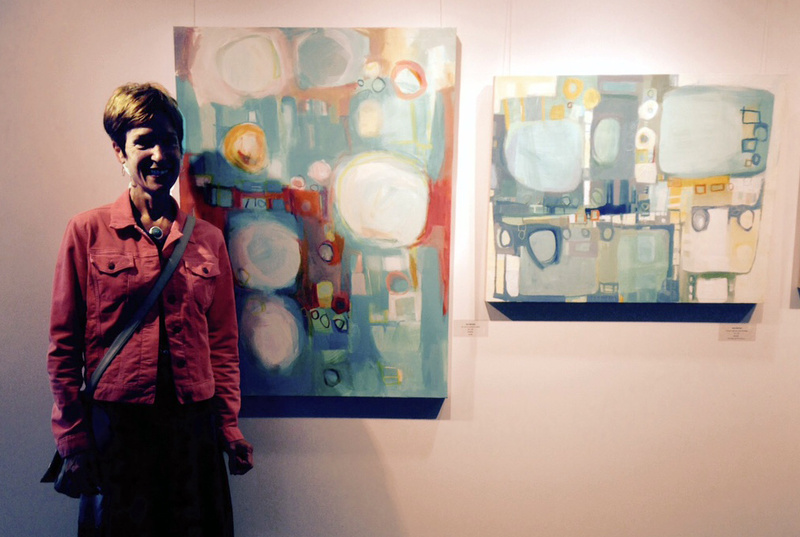 A great way to share my process and my art! 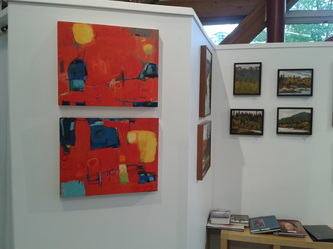 I am happy to exhibit in the community space at the North Vancouver District Hall. 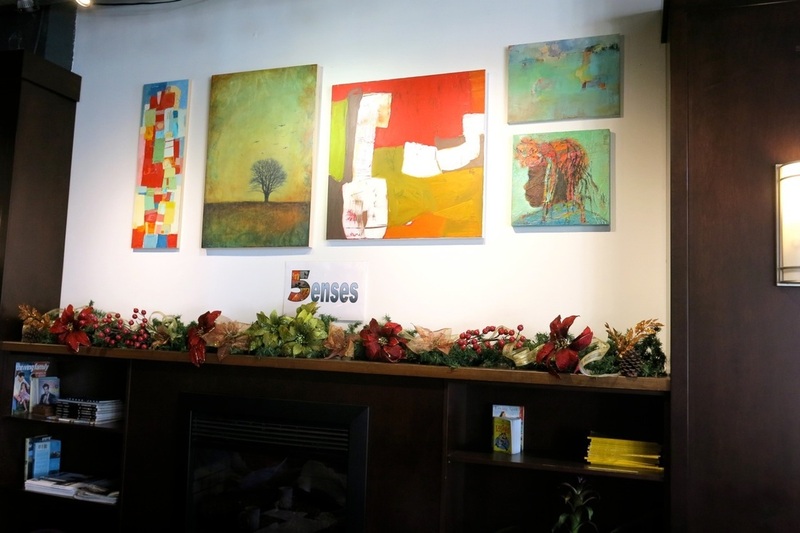 Drop by to see my Newfoundland-inspired abstract works on the walls, down the hall as you pay your Property Taxes...hopefully the art will put a smile on your face! 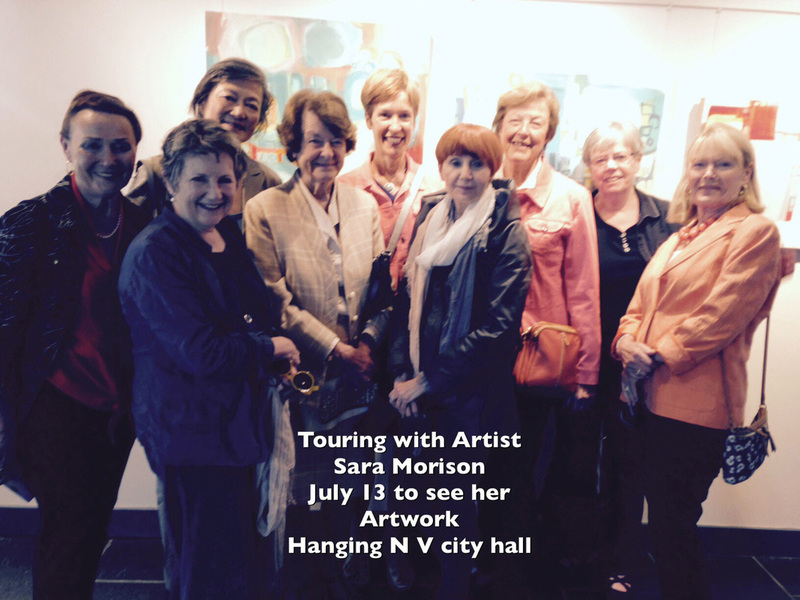 The show runs June 15-August 16th. 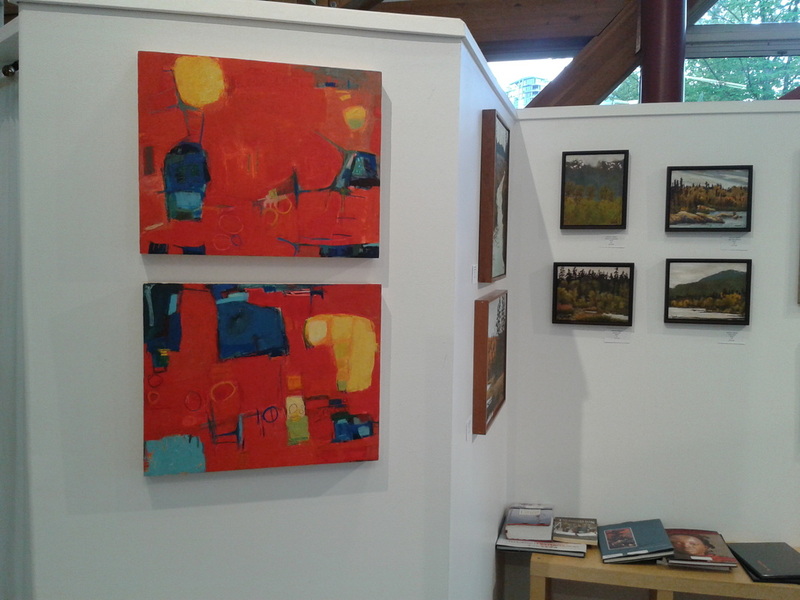 I currently have 6 works (including these 3) in the art rental program at the North Vancouver Community Arts council...it's a great way to have art in your home or business for a short or long time at a very reasonable price point! In October, I taught a fun Abstract Painting workshop at the Music Box in Ambleside West Vancouver...a great group of women who let their guards down to paint freely and with heart on large paper! 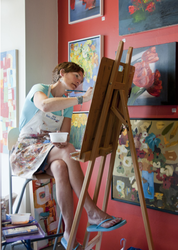 I'm excited to be showing my work alongside other art instructors' pieces and to be able to offer a weekend Abstract workshop this October 18-19, no experience necessary! 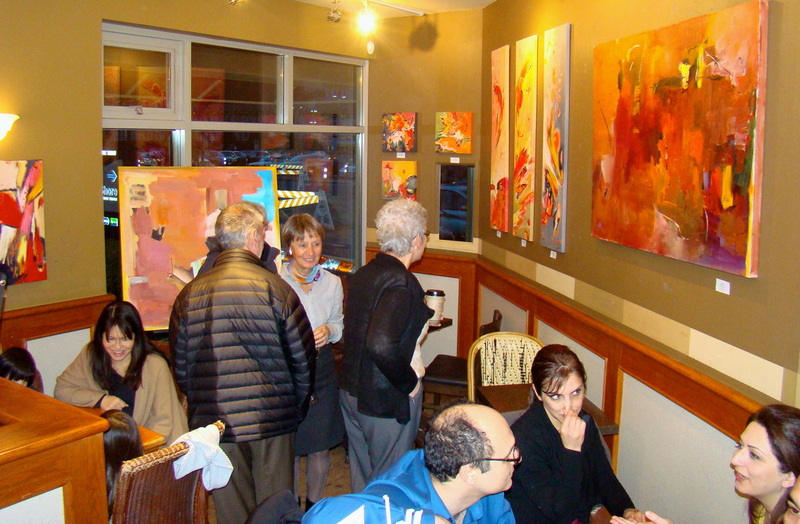 Twice a year the North Vancouver Community Arts Council displays much of their art rental collection in the beautiful gallery space on Lower Lonsdale. I currently have 6 pieces in their collection. 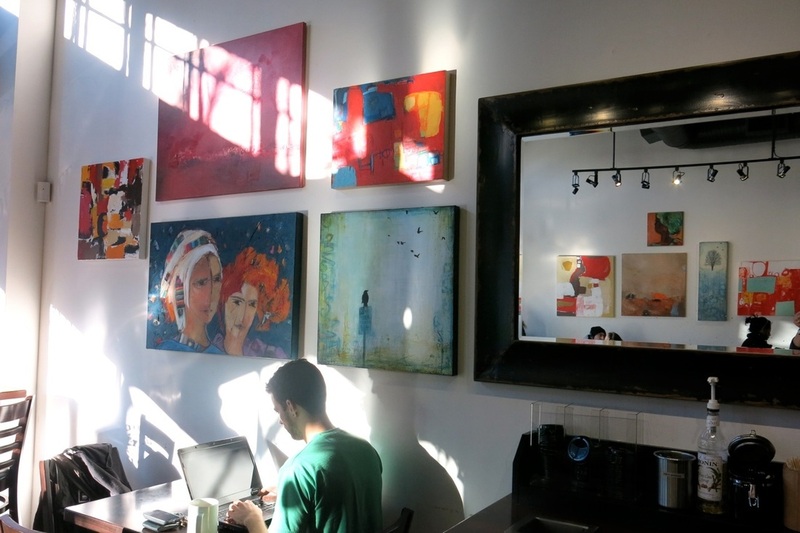 Renting art is a great and affordable way to display original pieces in your home or office. 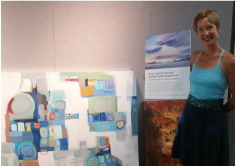 Just got word that I was awarded an Honorable Mention in this show for the painting on the left entitled Lend Me Your Heart, 48x48! I am very happy to have 2 photographs in this exhibition which is part of ﻿CAPTURE PHOTOGRAPHY FESTIVAL﻿. 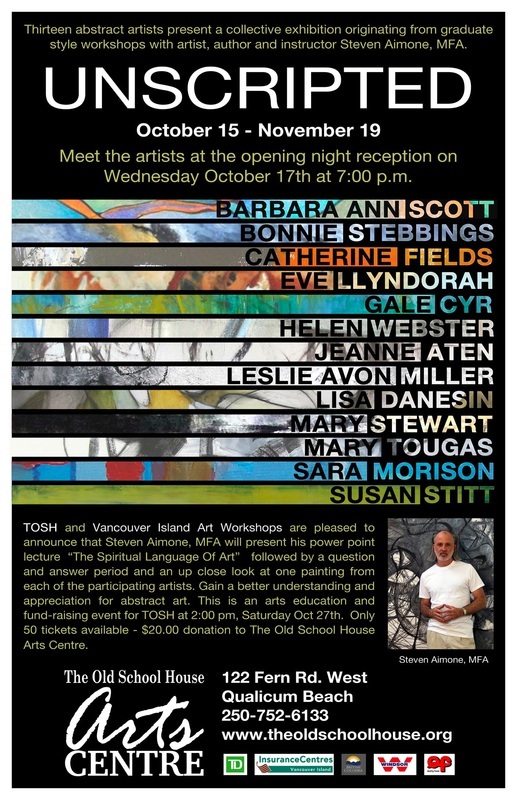 I'm excited to have two 40x30 paintings in this beautiful show! I opened the doors to my studio and little gallery space for the 5th Annual Art Crawl and nearly 90 art lovers walked through!! 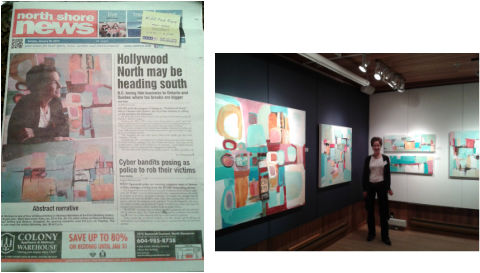 It was great to chat about my process, encourage emerging artists, and get to know some new appreciators of abstract art! 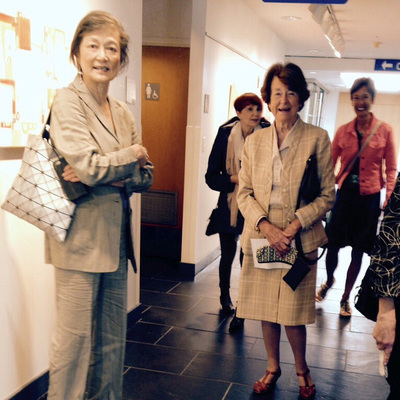 In February 2015, I taught an abstract course on velum paper. 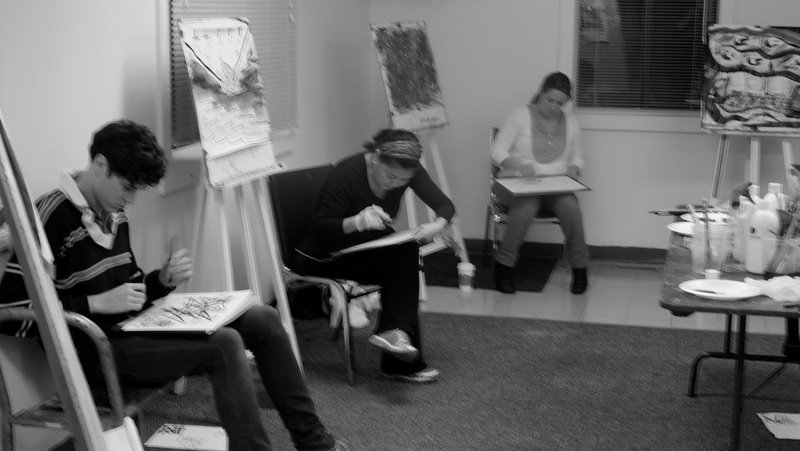 The 4-week structure afforded the students time to experiment with different drawing tools and a minimal acrylic painting palette, to free them up by working on large paper surfaces. A great group who said they learned a lot and enjoyed the intuitive process! 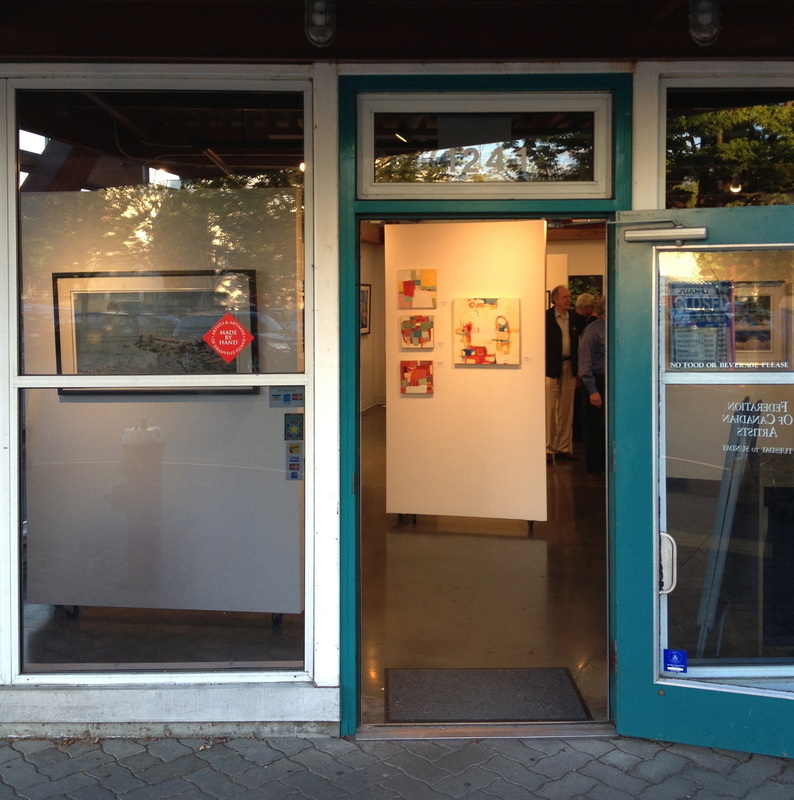 I currently have 6 works in the art rental program at the North Vancouver Community Arts council...it's a great way to have art in your home or business for a short or long time at a very reasonable price point! 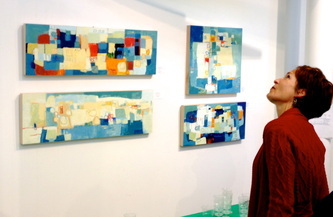 I am excited to participate in a group show of abstract works all using the colour Cerulean Blue! 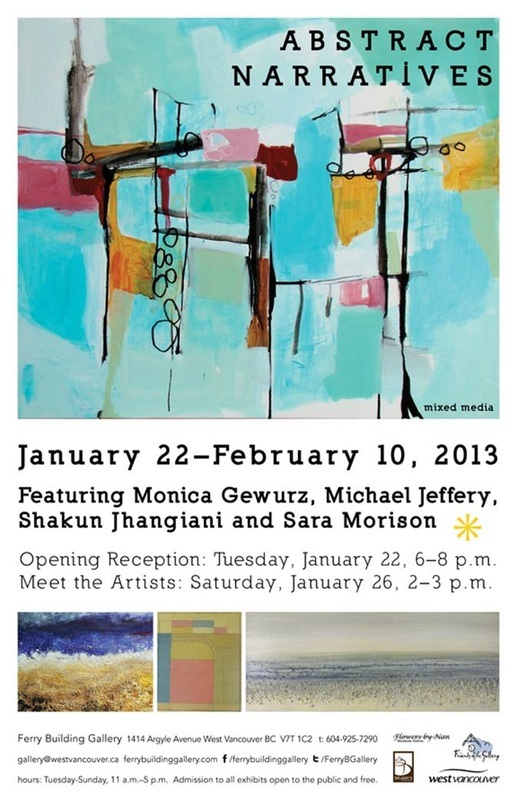 The opening is on Jan 29th, hope you can join me. 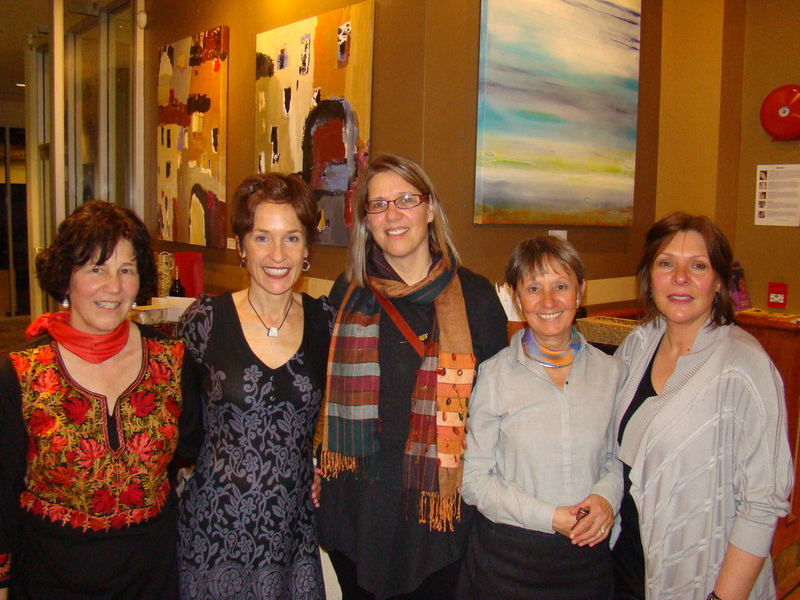 The 5enses (including me!) 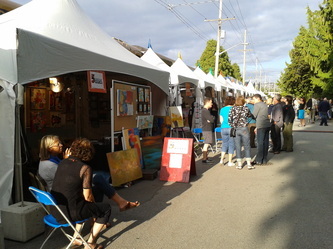 will be participating again this August long weekend in this exciting festival of art, craft, music and food. 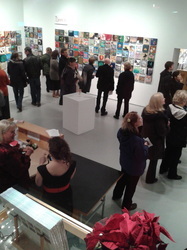 11am - 9pm Sat, Sun and Monday. The full event runs August 1st to 10th in Ambleside, West Vancouver along the beautiful seawalk...I hope you can drop by our tent to see what we have been working on this year! 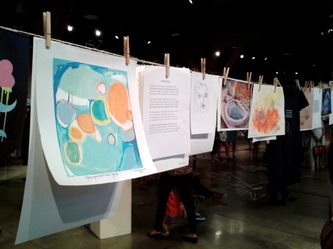 1st Prize in the Canvas Unbound show at the Federation Gallery on Granville Island. 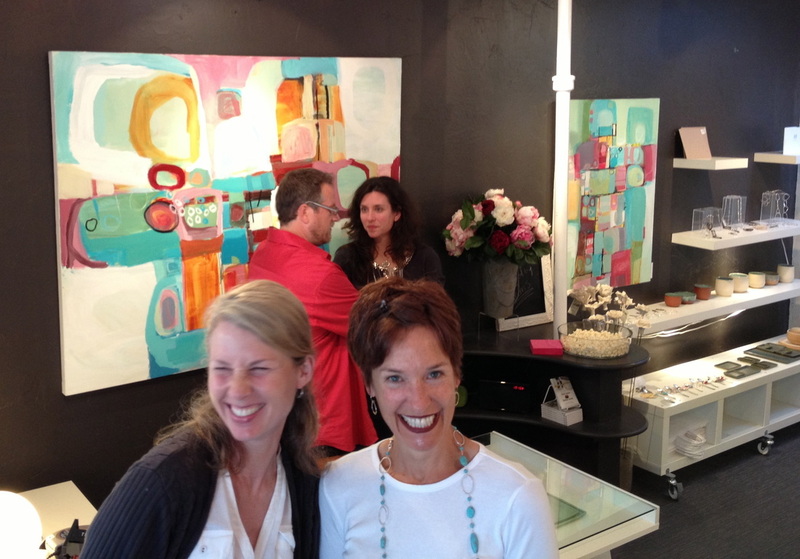 For the first time, I opened my studio up for visits during the Annual North Shore Art Crawl. 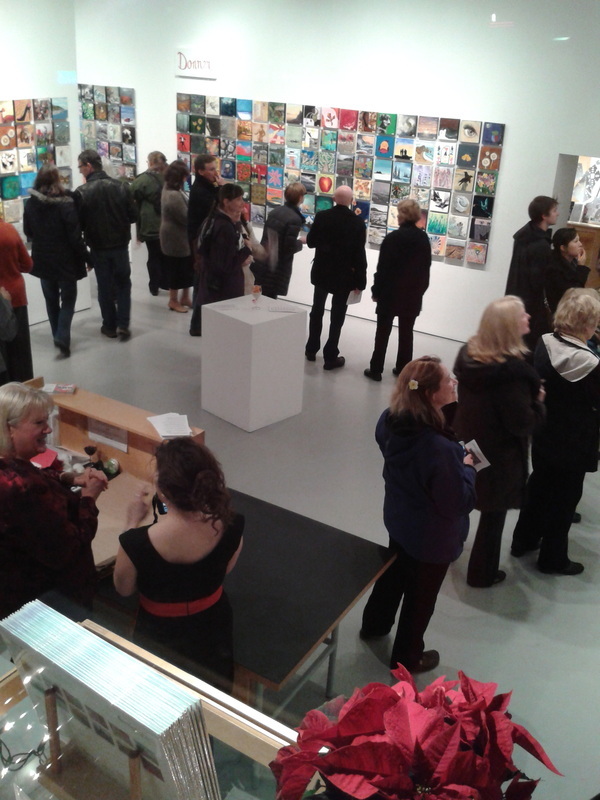 Close to 100 people dropped by to see where and how I create my abstract works and see what I've been working on these past few months. Thanks for the interest in my work! 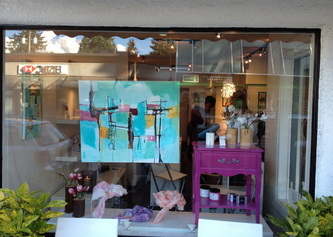 I'm excited to be doing a demonstration at OPUS in North Vancouver, April 13th 2-4pm. I will be detailing how create some of my abstract work using cold wax and oil paints. Join me! 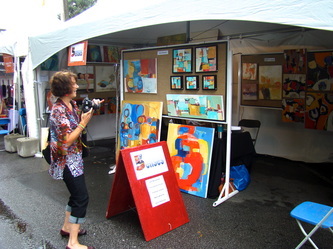 I'm very excited to have been asked to show some of my abstract work at this large gallery on "gallery row" on Sherbrooke St two blocks west of The Montreal Museum of Fine Art! Below are the 3 paintings they have. I'm happy to be exhibiting at the Federation Gallery again in the group show entitled ABSTRACT. There are many beautiful works by other friend-artists Catherine Fields, Chris Kazeil, and Leslie Gregory. 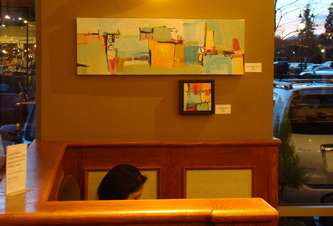 The 5enses are currently exhibiting work on the walls of the Bean Around the World. We are excited to be the first artists to show paintings in this renovated space. 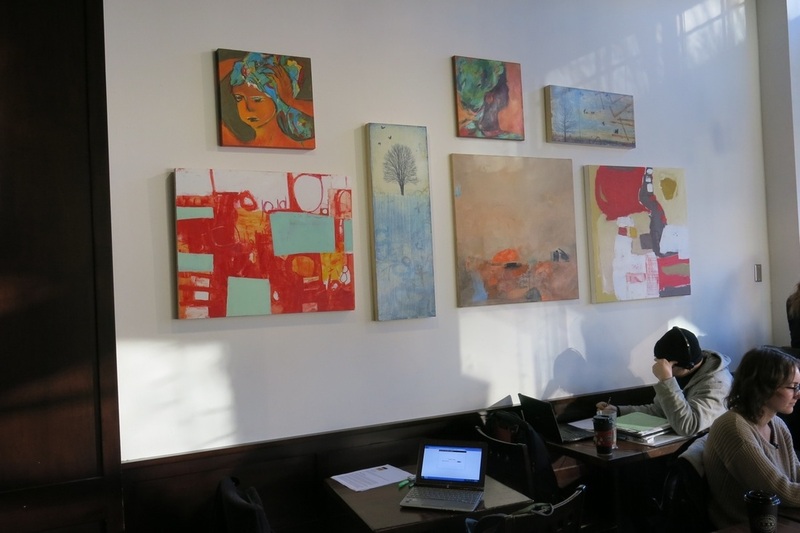 Drop by for a delicious coffee and figure out which paintings are mine the group! 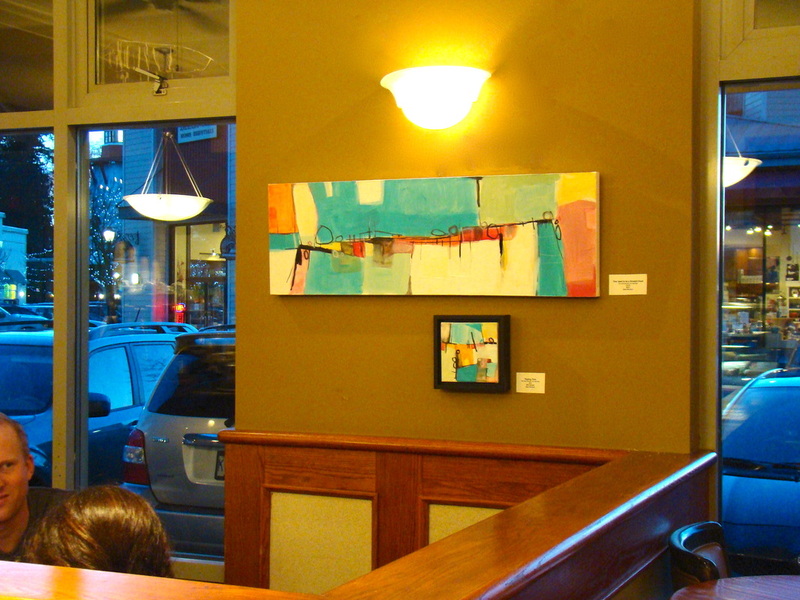 My work was highlighted at Bird on a Wire Creations, along with the works of the other 5enses, for the months of October and November. 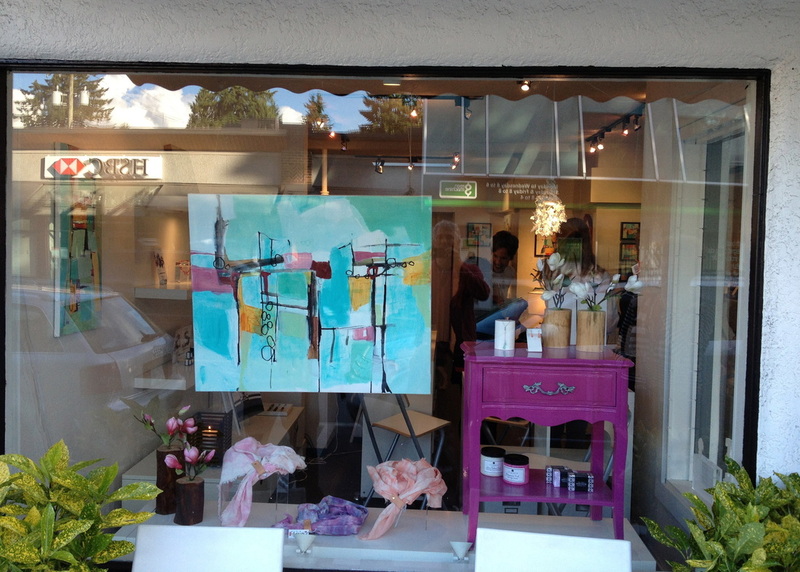 Drop by to see all the beautiful art and look for me in the window, painting, on Saturday November 16th form 11-4pm. 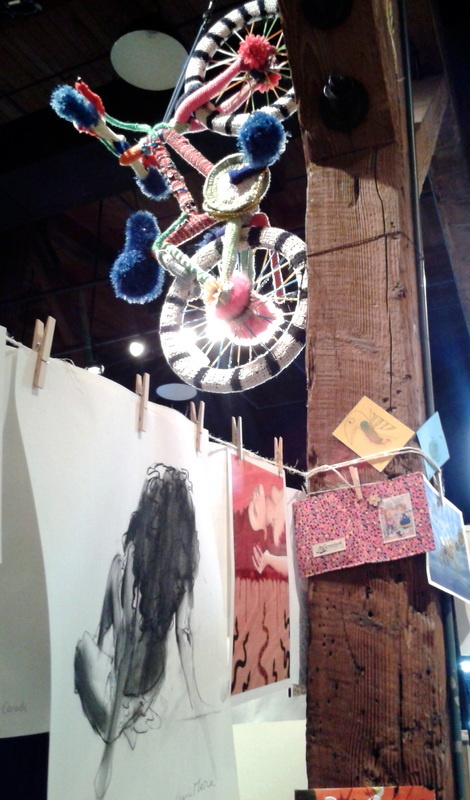 This is my 3rd year participating in Papergirl Vancouver, a creative outlet for works on paper which are then rolled up and delivered to passersby by cyclists! 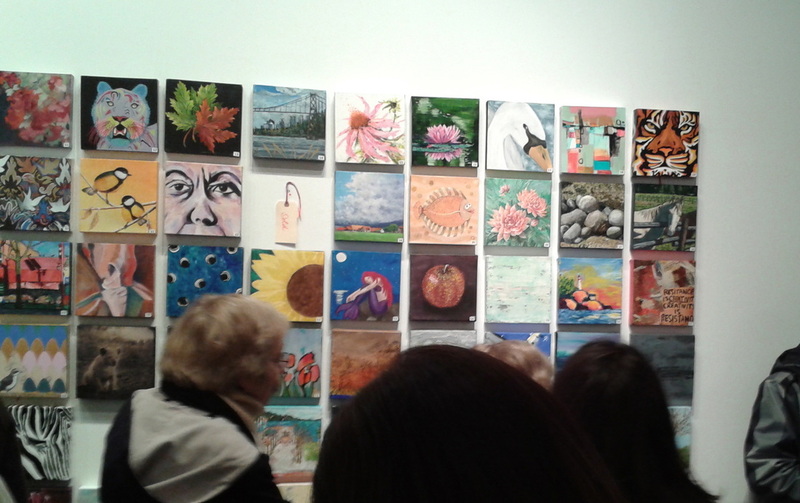 A great way to distribute art and create community! This was the first year that the 5enses collaborated to exhibit our work at the Harmony Arts Festival's annual ART MARKET. It was a great way to meet people, get the word out about abstract art and spend some time in the sun with paintings!! 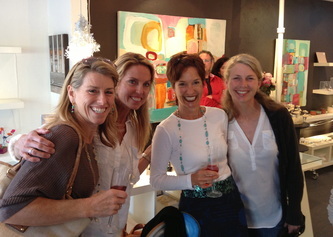 Thank you to all those who came to support me and share a glass of wine! 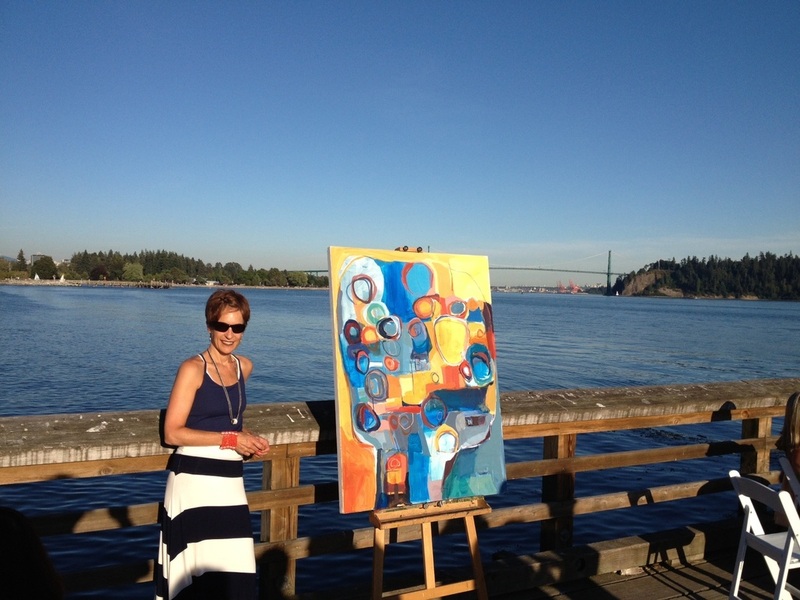 And THANK YOU to the couple from Edmonton who bought the grouping of 4 paintings in the first photo below!! 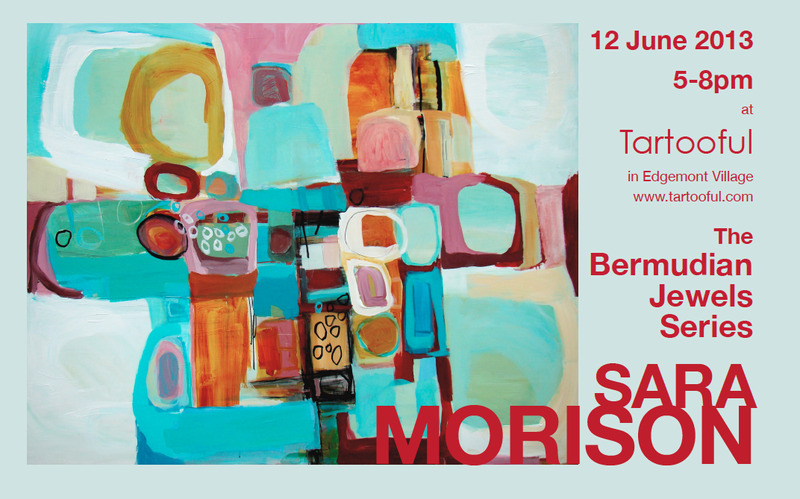 This is the 4th year that I have participated in this annual group exhibition of over 100 artists, with all works under $800. It's quite a sight! 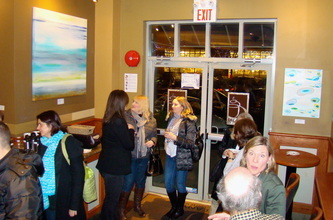 Stop by for delicious coffee and peruse the colorful art on the walls...fun times at the Wine and Cheese opening too! 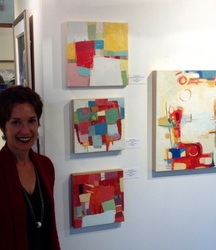 I was very happy to be participating in this 4-person group show of abstract works. I had wonderful comments and enthusiasm for my current series inspired from my summer 2012 trip to Bermuda and SOLD two of the works! This great exhibition of works for rent at the North Vancouver Community Arts Council is an inexpensive way to see and rent art for your home, office, cottage, where ever!! 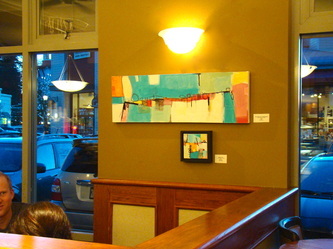 I have several pieces in the show. 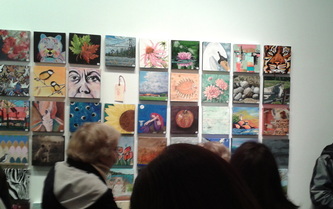 Annual fundraising event for the North Vancouver Community Arts Council...hundreds of works on 8"x8" canvases all for $100. Half of the proceeds go to the Council. 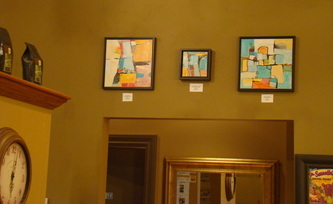 Both of my paintings sold on opening night, so they are no longer up on the walls....go see what is!! 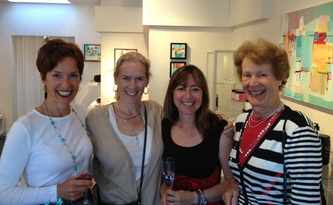 Beautiful group show exhibiting small works of art under 165 square inches! 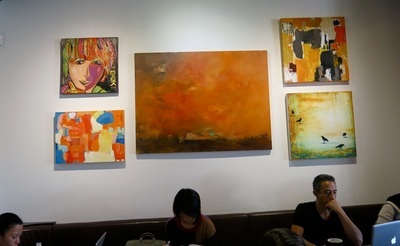 The Old School House Arts Center is presenting ‘UNSCRIPTED’, an exhibition and sale of the newest work produced by thirteen (including me) experimental abstract artists. 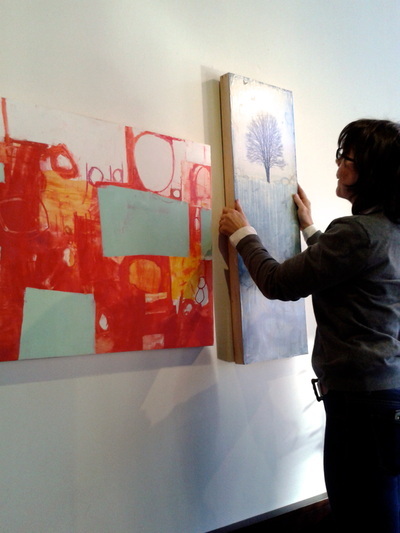 Over the past two years, these artists have completed a series of workshops and this show is the culmination of their extensive work and exploration.